Today as a company, we understand the importance of an accessible environment and company culture for people with disabilities, so that we can all contribute and benefit. Therefore it is important that events like conferences, seminars, courses and so on are accessible for people with disabilities and will enable all participants to enjoy the events. The goal of this guide is to educate and instruct the lecturers how to prepare a presentation that is accessible for all and how to present it in an accessible way. For Hebrew text the fonts David, Arial or Tahoma should be used. Fonts with curls or tails should be avoided. In English, the preferred fonts is Verdana. Fonts with curls or tails should be avoided. For numbers it is important to make sure that the chosen font presents numbers in a clear and defined way. For example, that the number "0" differentiates from the letter "O". In addition, numbers written in Latin should be avoided. The distance between the lines should be between 0.6 and 1. 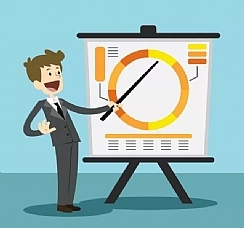 It is preferred to use a clean design, the background of the presentation should be simple and without pictures. It is important to use colors for the text and background that contrast from each other. For example, a black text on a white background or dark blue on a white background. The presentation should be suitable for color blind people, therefore the use of the following colors should be avoided: orange, green and red on the same slide. For movies and video clips, make sure that there will be subtitles for people that are hard of hearing and deaf people. Try to speak slowly and clearly and use a simple language in order for the audience to understand the presentation and for the transcription and translation to sign language. In case there is a picture or a graph on the presentation, it is important to describe the content for the benefit of the blind. When the audience asks a question, the question should be repeated before answering the question in order for the people that are hard of hearing or deaf to understand it. When a person with hearing difficulties is speaking and is being translated to sign language, it is important to look at the person speaking and not the interpreter.